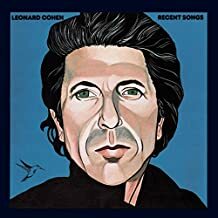 Leonard toured this album, mostly in Europe and I have a live album; a Paris radio broadcast, again only released recently. No real surprises here, except a song ‘Store Room’ which was never officially released (no wonder – it is pretty dire), but nice renditions all the same. Side two opens with two more sad songs ‘The Traitor’ and ‘Our Lady Of Solitude’ followed by a concert favourite ‘My Gypsy Wife’ Leonard saves the best for last; a sensuous duet with Jennifer Warnes ‘The Smokey Life’ and the final song ‘The Ballad Of The Absent Mare’. I simply adore this record – it is really all of one piece – and maybe more than any other record established the idea of Leonard being ‘Depressing’ in the general population. But I have always felt much much happier after listening to this one. My reaction si almost always to want to play it again. Just recently, sucker that I am, I bought a live radio concert from the same year – Upon a Smokey Evening. It’s pkay -sound quality a bit poor and no surprises.